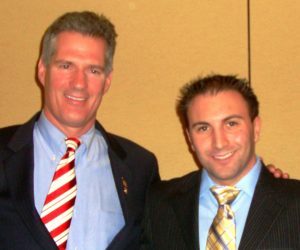 Senator Scott Brown Hosted his “Second Annual Christmas with Senator Brown” Holiday dinner and fundraiser at the Park Plaza Hotel in Boston Saturday Night (December 9th). The Gala Event held in the Park Plaza’s opulent ballroom was the perfect picture of holiday splendor. The event offered the opportunity for friends and supporters to rub elbows with the Pick-Up-Driving, straight-talking Senator and his family Gail, Arianna, and Ayla. Among the roster of special guests was Boston’s favorite come-back-kid Doug Flutie who rocked the crowd with his Doug & The Flutie Brothers Band. The Jacobs Law Firm was represented by Junior Partner Attorney Stefano V. D’Agostino. During the event Attorney D’Agostino logged some face-time with the Senator. As the new year approaches, Team TJL continues to expand their professional network. Sign Up below for The Jacobs Law News Letter and stay informed on all Team TJL News, Events, and Legal Accomplishments.